Many, many units of lack of warm, just a whimsy of skywater, a butterfly's' cough of atmospheric movement and the merest glimpse of Dawn's crack at the Castle this pancake flipping morn. All is well with poor old Angus, bits that should work are and bits that shouldn't don't, his Maj is full of the joys of something and the smart cat flap is performing within expected parameters. 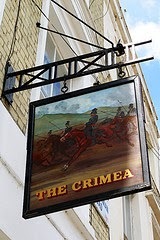 Well it's finally happened, landlady Mrs Floppybits dahn at the Crimea pub dropped her breakfast tray causing a global crisis. Much coffee was lost causing a surge in the price of the beans throughout the globe, her toast was lost to the hot liquid meaning that the cost of wheat soared, the spoilt milk caused Tesco to reduce the retail price of 4 pints, the boiled egg exploded which brought about a steep increase in the retail price of chucky ovals, which in turn made the price of fowl meat burst through the 5 squid barrier and spawned a frenzy of buying in the feather pillows and duvet market. The broken cereal bowl made a huge dent in the floor tile industry causing the shares of B&Q to soar, which made the city panic over prices of wood, corn, cement, sheds, copper, brass, lead, plastic, furniture, garden tools, fencing and turfs. This lead to a rest break being cancelled and caused the price of tea to rocket and the result was a slump in the Rupee, the marmalade was ruined leading to a torrent of bidding on the orange markets and the backlash was that Florida is now bankrupt and the American economy is on the verge of collapse. Back in Blighty the city has stalled, with no commodities left to make a profit on our economy has dived back into the sewer and we are all stuffed, in fact the world is going to end tomorrow because some knob head has revived a thirty thousand year old virus found beneath the permafrost up Norf (and a bit more). So there we are:-fucked, all because of a lost brekkie in the Crimea and the scaremongering of the media and twats that can't mind their own business and take a delight in winding up the world.